The Monster Hunter franchise started on the Playstation 2 and can be described as an action role playing game where the player takes control of of a hunter charged with killing monsters and completing various other quests and tasks in a diverse and bustling environment. I have always looked on at the Monster Hunter games thinking of it as Pokemon on steroids and hoping to one day be able to dive into the Monster Hunter world. 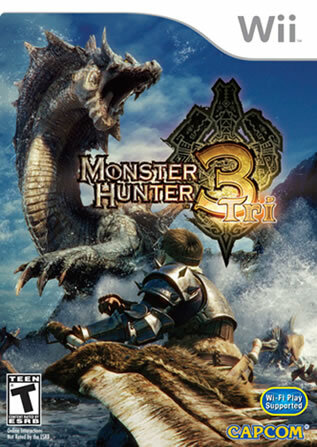 That day is drawing closer and closer as I have been following the latest Monster Hunter game entitled Monster Hunter Tri which after a few heartbreaking delays will be released for the Nintendo Wii next month in North America. It looks like my underutilized Wii may finally become reacquainted with my hands other than when I need to pass a difficult level for my younger sister in Super Mario Galaxy. Barring any unforeseen hiccups like region blocking I am looking forward to diving into the additive Monster Hunter world soon especially for the online and offline co-op multi-player monster slaying, exploration action and wiispeak support – trailer embedded above. Monster Hunter is already HUGE is Japan as it is the best selling non-Nintendo published game on the mega popular console with well over 1 million copies of the game sold in Japan since it’s release in August last year. Looking forward to Monster Hunter Tri? Ever Played a Monster Hunter game? Pre-order yours on Amazon now for $60 with the Classic Controller pro bundle or $45 for the standalone game. I love Monster Hunter. So much fun. I’ve been playing Monster Hunter Freedom Unite on the PSP since it came out. I wish I had a Wii to play Tri, but I can’t afford to buy a Wii just for one game since no other Wii games interest me. Have fun with it man. Now it’s my turn to be jealous. I was fortunate enough to play this at a capcom europe and i must say the game is SUGOI! it’s a must buy if you have a Wii. I’ve not played this series but will read up/check it up sometime. My wii got lots of love this year thus far because I am finally playing games that I should have played 2 – 3 years ago. “No More Heroes” and “No More Heroes 2: Desperate Struggle” make the thing worth it, and I’m only now playing “Okami”. And with “Super Mario Galaxy 2” at the end of May and the possibility of a new Zelda game at the end of year, I too will be spending even more quality time with my Wii… since 2006.
the intro looks good but your fighting monsters all the time? I don’t know, I haven’t heard anything about the story or anything much else. I guess there has to be some story in it but I’m on the borderline on this game. Red Steel 2 is definately going to flop – its trying too hard. Okami is a good bueatiful game, just too long winded (still playing through it now). the story isn’t much to talk about but it is a great game once you get used to the controls.